My Child Isn’t Walking – Should I Be Concerned? Walking, one of the major milestones that people know in a child’s development. Walking can happen at any time. You have kids that are walking before they are a year old and some that are still working on it once they’ve turned two, or even older. If you ask my family, I was running before I turned one but am still working on mastering the concepts of walking without tripping! There are so many pieces that go into walking. When you stop to think about all the parts, its amazing that any of us got up off the ground, let alone took our first steps! There is such a wide range of ages for kids to start walking and many families may ask their pediatrician’s about if they should be worried if they aren’t walking by age one, or by age one and a half, etc. That in and of itself isn’t a concern, however what you need to look at is what they ARE doing. If you take a look at the precursors to walking it may give you a better idea about whether or not you should be concerned. 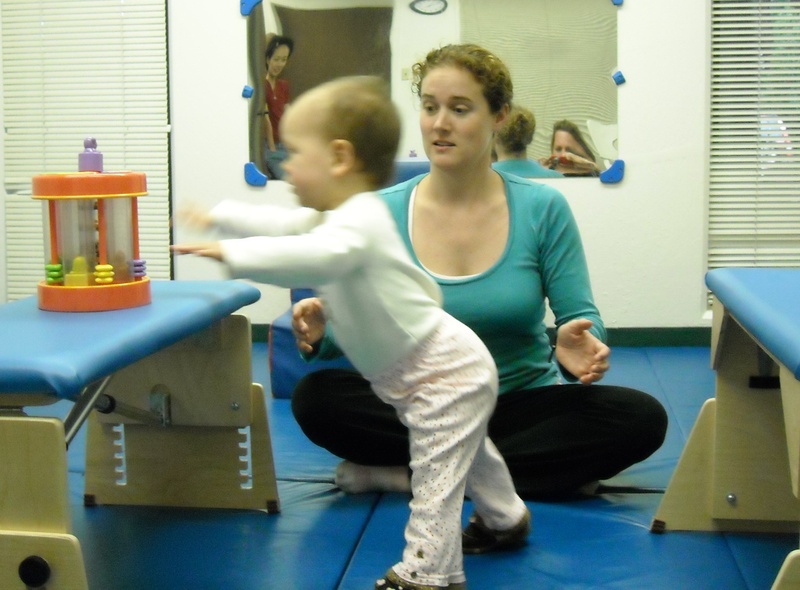 Prior to a kiddo being able to walk they need to be able to stand. So look at if your child is pulling to stand at furniture or if they are standing holding onto your hands or they may even be standing all by themselves. A lot of times kids will start pulling to stand in their crib and bouncing up and down. This is how they are learning about how their muscles work so that they can use them in this ‘new’ upright position they’ve discovered. If your child is standing but not yet taking independent steps then the next thing you want to look at is if they are cruising. Are they moving sideways along the furniture while holding on? This process helps them to learn how to weight shift so that when they begin to take steps they know to put their weight over one foot so they can lift the other foot up and step. If they are cruising but not walking you want to next consider if they are attempting to move between pieces of furniture. This is a more advanced form of cruising. You can encourage this by having your couch and coffee table and chairs spaced out so they will have support to target as they attempt to move around on their feet. They may be taking one or two steps between the objects or they may be keeping their feet planted while they reach as far as possible to get their hands on that next support surface before they move their feet. If they are doing this but not walking then they are almost there. You just want to create opportunities for them to have to take steps more and more on their own. Maybe its moving a short distance from mom to dad or from the couch to mom. Make it motivating and they will move! It won’t be pretty initially because it will look more like a lunge at the support surface but that is how they learn how much of each muscle group to turn on so that they can eventually maintain their balance and move. So, as you start to ask yourself if you should be concerned work backwards looking at what they are doing. Get them solid on their building blocks that lead up to walking and they will get to walking sooner. Just make sure you are ready for them to be into everything! !